Los Angeles international airport is amongst the biggest in the USA servicing almost 85 million passengers in 2017. Is it really surprising that airport parking can be stressful with so many passengers and so many parking options? Take away the stress and reserve your spot at Joes Airport Parking with Looking4.com. 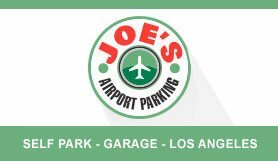 Joes Airport Parking garage is right in the sweet spot of the airport surroundings, just outside the entrance to the terminal & offers 1400 self-parking set over 6 floors & 100% under-cover spots. Well lit, brightly colored and Joe’s unique recognizable branding, in Joe’s orange, green and red lettering. Joe’s popularity coming from some of the extra niceties like complimentary coffee and newspaper. Free shuttles depart every 5 minutes and take just 2-3 minutes. The shuttle operates 24 hours, 7 days. Joes is a popular and well-presented parking garage offering LAX travelers convenience and value. By making you reservation online with Looking4.com you will guarantee your spot and save money. Luggage Assistance & Car Care Services available to book on arrival. Please take your reservation confirmation email with you to the parking lot. Breathing the air in this parking garage can expose you to chemicals including carbon monoxide and gasoline or diesel engine exhaust, which are known to the State of California to cause cancer and birth defects or other reproductive harm. Do not stay in this area longer than necessary. For more information go to www.P65Warnings.ca.gov/parking. Pull in to the garage to park. Proceed to the red “Hotel Shuttles” area at the island outside baggage claim on the lower level. Conveniently located ½ mile from LAX. Go West on W. Century Blvd toward S. Sepulveda Blvd/CA-1. Pass Avion Drive, Joe’s will be on your right hand side.